The Backwoods Engineer: Grid Down: What if the "Drill" was the "Event"? ...A National Academy of Sciences report last year said that terrorists could cause broad hardship for months with physical attacks on hard-to-replace components. One estimate (from the Center for Security Policy) reckons that up to 90% of the American population will die within 90 days of a total grid collapse. How? And why so many? Consider how many systems of support rely on the electric power grid, and the cluelessness of most modern Americans as to how to get the necessities of life apart from the power grid. Humans have seven categories of needs: water, food, shelter, energy, security, sanitation and healthcare, and mental/spiritual health. In our present system, the first 6 are very heavily dependent on the electrical grid. Of first importance is water. In most cities, water is pumped by electricity, and then gravity is used to pressurize the system. 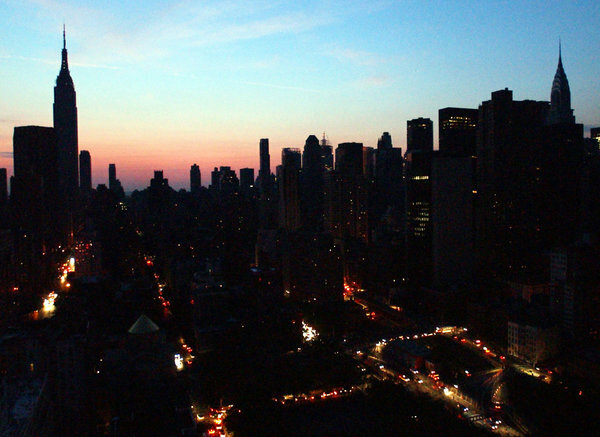 As we saw in the aftermath of Hurricane Sandy, many NYC high-rise tenements didn't have any backup power to pump water up to rooftop storage tanks. When those run dry, in perhaps 3 days, there is no more. And this will be typical of large big cities. Do most city people personally have hundreds of gallons of water storage, as I and other 'preppers' have? No. People will die of dehydration long before starvation kicks in. Along with water, there is sanitation. Millions of people in this country literally cannot defecate without government assistance. In the big cities, the sewers are pumped with electricity (or diesel, which itself is pumped by electricity). When that stops, people will start urinating and defecating everywhere (as happened in Auckland, NZ in 1998), adding the misery of dysentery and other diseases to the problems caused by dehydration. Next, consider shelter. In most areas of the US, people need protection from the outside environment, whether hot or cold. A grid-down event occurring in a cold November (as our "drill" is planned for) will result in a lot of people in America’s northern latitudes dying very soon. Environmental regulations have caused people to get rid of wood-burning fireplaces and heaters (burning wood causes Gorebull warming, don't you know). So what will happen in a grid-down scenario? People will burn their wood furniture in makeshift fireplaces, starting unintended fires, and entire blocks of apartments will burn to the ground, exposing more people to the elements to die. And those that are successful in not burning the joint down may suffocate from carbon monoxide. Conversely, if the grid was down during a very warm week in November, like many we have experienced before in the South, could easily kill off millions of the infirm and elderly from heat exposure and lack of air conditioning, which makes the South habitable. With all these terrible potential consequences, the government is surely building up the power grid's strength, right? Isn't that what all these "drills" are about? Obama and his administration are systematically destroying the power grid in this nation. Doubt me? What about the estimated 12% of coal plants that have been or will shut down due to the EPA's new rule on mercury emissions? Another estimate says that more than 34 gigawatts of electrical generating capacity will go offline in this decade because of the EPA's so-called MACT rules. One good thing is that there are a couple of sub-grids -- see the map below -- that could potentially operate independently should there be a cascade failure in one or more of the other sub-grids. 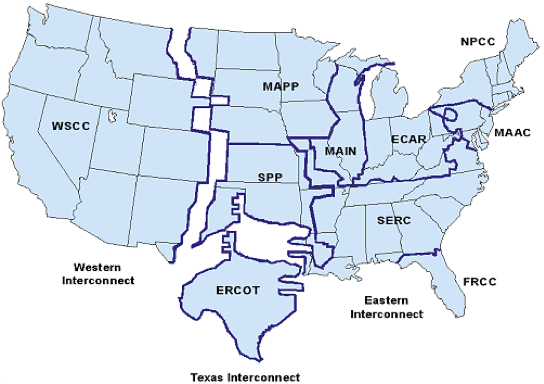 The ERCOT grid that covers most of Texas, for example, as well as the hydroelectric-rich SERC (southeast US) and WSCC (western US) grids, could operate independently if the operators had the lead time to disconnect them from other failing sub-grids. If this "drill" really is the real thing, we won't have much time to get our things together Best thing is to be prepared now. Forewarned is forearmed. I have thought about this for about 25 years. The threat is real, but I think 90% in 90 days is very high. I do not think all the grid will go down altogether, and even having 25% of the grid up makes an enormous difference. Still, if you had 75% of the grid down for 90 days, I think we could lose 30% of the population. That assumes that we have an administration in power that *wants* to save people. I know that is a big assumption with this administration. If I were going to do it, I would plan the attack for New Years Day. It is far, far harder to overcome cold weather than hot weather. I have seen some hardening go into place. We could have had excellent back up systems with a tiny fraction of the money wasted on the "stimulous". In Arizona, for example, we put natural gas storage for a week next to the backup natural gas turbines. That is a big deal, and gives the chance for power to be available to start up other producers. Nuclear plants need lots of power to start up, once down. They cannot create their own power to start.